Anjali G. Sharma is a native born Houstonian. 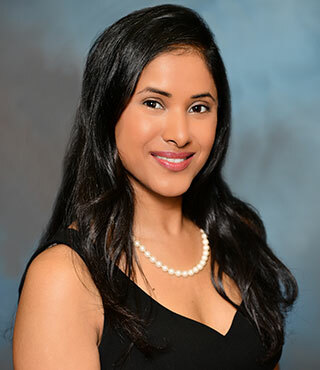 Anjali graduated from the University of Houston with her Bachelor’s Degree in Science in 2004 and went on to study law at the University of St. Thomas in Florida. She graduated with her Juris Doctorate in 2007 from St. Thomas University, was licensed by the State Bar of Texas in 2008 and has been practicing law since. Anjali has experience handling an array of cases, from family law, criminal and civil litigation. Currently she focuses her practice on Immigration, handling all of the Firm’s Removal/Deportation and Asylum cases. Anjali is well aware of the impact immigration proceedings places on families. Thus, she works zealously for her clients to insure the best outcome for their situation. From filing bond motions and attending the bond hearing so that her client may be released from detention to be with his family members to filing motions to re-open/re-consider cases and decisions that have been denied, Anjali knows exactly what must be done and exactly how to do it. Anjali tenaciously represents her Clients before the Immigration Court, seeking any and all relief her Clients are eligible for, including Asylum, Adjustment of Status, Cancellation of Removal, Stay of Deportation, VAWA, Withholding of Removal, CAT, and Voluntary Departure. Additionally, Anjali files for her client’s work permit if client is eligible so that they can work legally in the U.S. while their removal case(s) are pending. Licensed to practice in the State of Texas, and Federal Southern District of Texas. Sharma & Associates, P.C. is committed to providing our clients with personalized legal services in the areas of Immigration, Personal Injury/Accident, Criminal, Family Law and Litigation. © 2019 Sharma & Associates, P.C. All Rights Reserved.